While over 200 organizations lobbied on S.510, the Food Safety Modernization Act, no one seemed to notice an unconstitutional section in the bill until after it passed on Tuesday. That day, Roll Call advised that the bill contained a provision, Sec. 107, allowing the Senate to raise revenues. This violates Article I, Section 7, of the U.S. Constitution, granting that power exclusively to the House. S.510 opponents now celebrate the House’s use of the “blue slip process” to return the bill to the Senate. Apparently, the Senate moved too quickly. Their overreach only supports the natural foods movement assertion that the entire bill is over-reaching as the federal government seeks complete control over local foods. * American Farm Bureau Federation (a Big Ag and insurance industry lobbyist that supports the use of genetically modified foods). According to data at Open Secrets.org, AFB spent $9.5 million since 2009 to lobby for S.510 and against the House version. Food & Water Watch noted that AFB president Bob Stallman “condemn[s] consumers and farmers who oppose the industrial model of agriculture, referring to them as ‘extremists who want to drag agriculture back to the day of 40 acres and a mule.’” Clearly, the American Farm Bureau Federation does not favor small farms. * Agriculture services and products industry spent $34.4 million. In 2009 and 2010, Pepsi spent over $14 million and Coca-Cola spent $4.5 million on both S.510 and HR 2749 (the House version). Other groups supporting S.510 include the International Bottled Water Association, International Dairy Foods Association, International Foodservice Distributors Association, and the Snack Food Association. Hardly advocates of small producers or natural foods. Under the guise of food ‘safety,’ food control legislation has been widely supported by major food industry lobbyists, who spent over $1 billion since 1998 to influence Congress. Do the American people even have a voice in food choice, when measured against the hundreds of millions of dollars multinational corporations foist on Congress to influence legislation? Two final comments are in order: one on the ineffectual Tester Amendment and the other on Monsanto’s influence over food safety. First, the Tester Amendment “exemption” — defined as those generating less than $500,000 a year in revenue — is ludicrously low. Kraft Foods generates that every seven minutes: it earned $40 billion in revenue in 2009. There can be no single bill that adequately addresses food production when talking about producers as disparate as these. Small farms are in a different universe from multinational corporations. A ten-million-dollar exemption is more reasonable. Farms earning less than $10 million a year are much more similar to Mom & Pop operations than they are to Kraft Foods or Monsanto. Farms earning between a half million and ten million annually are more likely than Mom & Pop to achieve product consistency and, because of a higher output, lower market price, thus appealing to locavores on three levels. That ludicrously low $500,000 figure only highlights the overreach of an obese federal government. Second, the Tester Amendment does not exempt small food producers as broadly as proponents claim. Eric Blair noted that “even a ‘very small business’ making less than $500K per year, doing business ‘within 275 miles’ and directly with ‘end-user customers’ is still required to adhere to all of the [other] regulations” in the massive food control bill. In order to qualify for exemption, he points out that small producers must file three years of detailed financial records, detailed hazard analysis plans, and detailed proof of compliance with local, county and state laws. Then, the Secretary of Health and Human Services must approve each exemption. How many “food producers” who donate food to the homeless, or who supply homemade products at bake sales, county fairs, church bazaars, and community picnics are going to bother with such hyper-regulation? Obama’s vision of food “safety” destroys the local economy, and it destroys community relations. S.510 opponent Sen. Tom Coburn has repeatedly stressed that the bill will not make our food supply any safer and will “drive small producers out of business.” No wonder so many multi-billion dollar corporations support it. Finally, let’s not forget that Obama has stacked his administration with former employees of Monsanto, making Michael Taylor his Food Czar. Anything this Administration supports in the way of food control will surely benefit Monsanto, while harming the natural foods industry and small producers. Indeed, the Food and Drug Administration is already waging a bureaucratic war on private food contracts and natural food producers. Meanwhile, the battle for food freedom rages on, with a temporary reprieve now that S.510 has been recalled to the Senate Chamber. Yes, we do have food freedom, even if it means defying unjust laws. The Food Safety Modernization Act looks like it’s headed to become law. It’s being hailed as a “breakthrough” achievement in food safety, and it would hand vast new powers and funding to the FDA so that it can clean up the food supply and protect all Americans from food-borne pathogens. Yep, it’s true: Amid all the fear-mongering over salmonella, everybody forgot to notice that the vast majority of fresh chickens sold at grocery stores every single day are widely contaminated with salmonella (http://www.naturalnews.com/028661_c…). Yet S 510 does absolutely nothing to address this. It’s not even mentioned in the bill. A group composed of some 100 center-right Italian lawmakers have called for the Italian Prime Minister Silvio Berlusconi, to resign. Berlusconi is preparing for key confidence votes that are due to be held in the lower and upper houses of parliament this month. “The deputies … agree on the need to ensure the country has a solid and stable government to face up to the grave social and economic crisis,” said a statement published after a meeting of five center-right parties. The anti Berlusconi group is made up of allies of former Berlusconi loyalist-turned-bitter rival Gianfranco Fini, two rebel deputies from Berlusconi’s own People of Freedom party, as well as three smaller parties. Emma Marcegaglia, the head of Italy’s employers’ federation, said the country was “in paralysis” because Berlusconi and his allies were spending too much time dealing with scandals and corruption allegations. “Berlusconi must resign,” said Antonio Di Pietro, the leader of the Italy of Values Party and a former anti-corruption investigator. “If he does not want to do it for Italians, he should do it for himself. At least five people have been arrested in fresh clashes between student protesters and police outside of parliament in Athens over government austerity plans. Security forces used tear gas to disperse a crowd of approximately 1,500 students attempting to march to the British Embassy in Athens. The demonstrators showed unity with British students by holding banners which read, “Solidarity to the struggle of British students,” Reuters reported. British university students are facing an almost tripling of their tuition fees by the Conservative-Liberal Democrat coalition government. The ongoing demonstrations in Greece were sparked by public outrage against economic reforms, which include eliminating over-time pay and bonuses. The government agreed to the measures in exchange for a EUR 110 billion rescue package from the European Union (EU) and International Monetary Fund (IMF). In return, the Socialist government has also slashed pensions and salaries, increased taxes and made it easier for the private sector to sack workers and cut wages. Trade unions are strongly opposed to the measures and have been organizing demonstrations for months now. They are calling for a nationwide general strike against the EU-IMF bailout on December 15 — the seventh this year. Student groups are planning sit-ins on university campuses around the country. Protests will also be held on Monday, December 6, to mark second anniversary of the police shooting of a teenager, which led to nationwide riots. Knowing President Obama and his Attorney General Eric Holder as we do, we suspected that this initiative had nothing to do with controlling corporate thieves in the United States. Instead, we guessed, the initiative was targeted at foreign kleptocrats. And lo and behold, we were right. In July, Holder announced the Justice Department’s kleptocracy initiative at the African Union Summit in Kampala, Uganda. “We’re assembling a team of prosecutors who will focus exclusively on this work and build upon efforts already underway to deter corruption, hold offenders accountable, and protect public resources,” Holder said. The kleptocracy initiative fits well with Obama’s take on concentrated corporate power and corporate crime – stand up and fight it overseas, enable it at home. Kleptocracy – from the Greek – is literally government by thieves. Of course, this definition is a perfect fit for our military industrial complex. For the Wall Street/Washington axis. And most visibly, for our health insurance cabal – made up of the major private health insurance corporations – UnitedHealth, Aetna, CIGNA, Wellpoint – and their handlers in Washington – most recently and most prominently – President Obama, Senate Majority Leader Harry Reid, Senator Max Baucus, Speaker of the House Nancy Pelosi. These are the officials who controlled government health insurance policy. They had in their hands a policy that would strip the thieves – health insurance corporations – of their power over the governed – the rest of us. Single payer national health insurance. Obama knew how to fight back against the health insurance kleptocracy – and in fact in 2003 said he would in fact push for a single payer system – once the White House and Congress were in the hands of the Democrats. But when Obama and the Democrats took power, they became part of the health insurance kleptocracy. Under a single payer system, the private insurance corporations would be given the death sentence. In their place, we’d create a public insurance pool – everybody in, nobody out. This would save the governed about $400 billion a year, cover everyone, and save about 45,000 lives a year. So, we hereby propose a kleptocracy initiative for the United States. End the wars in Iraq and Afghanistan. Crack down on corporate crime. And when we finally get a President willing to fight kleptocracy at home as well as abroad – maybe he or she will launch the new initiative not in Uganda. But right here in the USA. Russell Mokhiber edits Single Payer Action. On January 29, 2002, former President George W. Bush designated North Korea as one of three nations in the “axis of evil”. Bush made it clear that these countries were enemies of the United States and that they would be targets of future US aggression. Shortly after Bush’s State of the Union Address, the administration released its National Defense Strategy which claimed the right to preemptively attack countries it saw as threats to US hegemony. Naturally, North Korea took these developments seriously and prepared a strategy to defend itself against a US attack. Less than a year after Bush’s speech, North Korea withdrew from the Nuclear Non-Proliferation Treaty (NPT). And, six years after that, on May 25, 2009, North Korea conducted a nuclear weapons test in a remote north-eastern area of the country which triggered a 4.7 magnitude earthquake. Experts now believe that North Korea has a stockpile of between 6 to 9 nuclear weapons. North Korean leaders were forced to develop a nuclear arsenal to defend themselves against US aggression. It was a reasonable response to Bush’s saber rattling. So, the North has nukes and has thus spared itself a fate similar to Iraq’s. No doubt, leaders in Tehran are looking on with envy. So we can see that, however foolish, this was not an act of aggression on the part of the North, but defense. The US/South Korea military exercises are intentionally provocative. The North merely did what it felt it had to do to send a message that it will defend its borders. US citizens would expect nothing less if Russia and China were carrying out military maneuvers on the Canadian border or off the coast of San Diego. Barack Obama is following in the footsteps of the early Bush administration. Bush eventually learned that hostility does not work with North Korea, so he backed down. After six years of belligerence, Bush caved in to nearly all of North Korea’s demands and got nothing in return. The UN’s nuclear watchdog agency, the IAEA, did not gain access to Kim Jong-il’s nuclear stockpile or to its “Top-Secret” file on weapons programs. Nor were IAEA inspectors allowed to conduct surprise “go anywhere, see anything” inspections. None of Bush’s main objectives was achieved, in fact, the ex-president even had North Korea removed from the State Department’s list of “supporters of terrorism”. All the while, the North continued to develop its long-range ballistic-missile delivery system, the Taepodong 2, which will eventually be able to strike cities in the US. Now Obama wants to resume hostilities with the North, while expecting a different outcome than Bush; tougher sanctions, more military exercises, more pressure from allies, and a stubborn refusal to conduct bilateral negotiations. It’s madness. There’s been no change in the approach at all. If anything, Obama has taken a harder line than Bush. And what does the North want? There it is in black and white. The US can end the conflict today by just keeping its word. Unfortunately, the United States never had any intention of meeting its obligations under the terms of the Agreed Framework or of resolving the nuclear issue on the Korean peninsula. From the very beginning, the US stalled on its promise to build 2 lightwater reactors to meet the North’s electrical needs. None of the essential components–turbines or generators–were ever delivered. A foundation was built for one of the reactors, but nothing more. The US also agreed to organize an international consortium to guarantee funding for the reactors, but never followed through. The US never made any effort to keep its end of the bargain. So, (reluctantly) the North withdrew from the NPT and build 9 nuclear weapons. Of course, none of this appears in US media where it might interrupt the daily flow of anti-North Korea propaganda. Bottom line: The reason there is no peace in Korea is because Washington doesn’t want peace. It’s that simple. 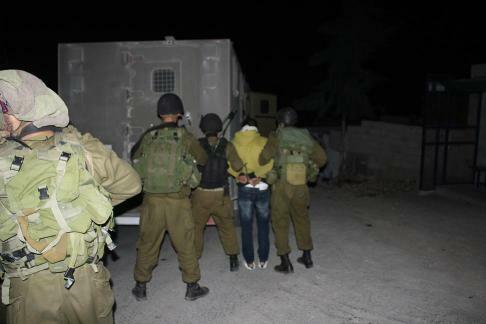 Mohammed Abu Rahmah was arrested from his house during a military nighttime raid on his village of Bil’in on November 23rd. Abu Rahmah, the son of imprisoned Bil’in organizer, Adeeb Abu Rahmah, was released without charge on Monday, and reports being harassed and beaten during his questioning. On November 23rd, 2010, Israeli forces entered the village of Bil’in and stormed the home of imprisoned Bil’in organizer, Adeeb Abu Rahmah. After conducting a short search of the premises, the soldiers arrested Adeeb’s only son, sixteen year old Mohammed, who was taken away bound and blindfolded. Mohammed reports being taken to the Maccabim military base, where he arrived at about 3 AM. He was then, still handcuffed and blindfolded, transported to the Ofer Military Prison, where the authorities refused to process him. Mohammed was then taken back to the Maccabim military base, where he was held until 11 AM, still with cuffed and blindfolded, and without being allowed to go to toilet. Finally arriving at Ofer Prison at around noon, where the shackles and blindfold were eventually removed, Mohammed was taken into interrogation without allowing him to catch some sleep. On entering the interrogation room, he was cuffed again in both hands and legs, and sited on a chair in front of a man who introduced himself as “Captain Fares”. The interrogator then told Mohammed that the case against him is rock solid and can lead to a sentence of up to a year in jail. “Captain Fares” then said that the only way for Mohammed to avoid imprisonment is to “cooperate” – by which he meant confessing to the unfounded suspicions against him, and incriminating others. When Mohammed refused to confess or incriminate others who the interrogator mentioned by name, “Captain Fares” responded by shouting at him, cursing him, and a few times even assaulting him physically with slaps to the face. At some point, as Mohammed kept insisting on his right to remain silent, the cuffs around his wrists and ankles were tightened even more then they were before, and the interrogator grabbed his neck as if he was about to choke him. When Mohammed refused to identify his imprisoned father in a picture shown to him, he was punched in the chest. After about two hours of violent questioning, Mohammed was asked to sign a paper with a transcript of his interrogation, which he refused to do, and was then physically forced to give his fingerprints. It is common practice in Israeli interrogation rooms to try and extract confessions and incriminations from detained Palestinian minors using threats and abuse. Many cases and convictions at the military court, including that of Adeeb Abu Rahmah, Mohammed’s father, are based on such incriminations by detained youth. Mohammed, who since his father’s arrest, 17 months ago, Mohammed serves as the family’s sole provider, was eventually released from custody Monday night (November 29th), on 8,000 NIS bail since the military prosecution could not present evidence justifying his remand. In the wake of the controversy which just passed in the U.S. over full body scans and more hands-on pat down procedures in airports, some pundits and security “experts” are calling for the Israelification of American airports. These supporters sing praises of the system in place Israel’s single international airport. They say it is focused more on actual security rather than “security theatre,” yet I would argue that Israelification already has a firm foothold in America, and not just in our airports. The increasing normalization of war crimes conducted and justified in the name of fighting terror, the growing specter of the security state with the patriot act and warrantless wiretaps, ascendance of the “clash of civilizations” worldview among Americans pitting East versus West, and the parallel growth of Islamophobia have all pulled the American mindset closer to the Israelis’. American airports also seem to have copied one title aspect of the Israeli screening system though certainly in a more discerning and less blatant way, namely racial profiling. Reports of Muslims and Middle Easterners being harassed at airports, kicked off flights on suspicion or making other passengers uncomfortable, and targeted for extra security shot up after 9/11 and remain frequent. Anecdotally, I can tell you as a Palestinian American Muslim that every time I have flown in the States, I would be singled out for the “random” extra screening. When I fly internationally I can always expect to be escorted to the Homeland Security Office where I generally wait for at least a couple hours to be interviewed about my trips abroad. Now my experience can be explained away by the authorities because most of the traveling abroad I do is in Syria and the tense relations between it and America. Yet the pundits today calling for even more of the same don’t seem to understand the depth of what they are asking for. Rafi Sela, the Israeli president of AR Challenges, a global transportation security consultancy, compared American and Israeli security procedures in an interview with the Toronto Star. He said Israel’s six layers of security hinges on “behavioral profiling” rather than screening for physical threats alone like Americans. Starting at the gate before even approaching the terminal, security officials stop every vehicle coming to the airport and look for signs of distress or nervousness from the occupants. Armed guards outside the terminal observe people as they move towards the doors also looking for suspicious behavior. At the gates, security agents “randomly” select certain passengers to be searched and pass through a metal detector. Inside, while waiting for the baggage scan, an interviewer conducts a 30-second interview, again looking for suspicious behavior and flags some passengers for an extra screening. Before checking in, all luggage is scanned in an X-ray machine. Finally, the last step is the body and hand luggage search much similar to the standard one-step American search except you can keep your shoes on. In all, it should take most passengers no more than 25 minutes to get from the curb to the airport lounge, according to the Toronto Star. Yet the glaring deficiency in the whole system is that the system focused on profiling relies on the subjective judgment of the security guards who choose who to give extra attention to and who not. The screening practices take little effort to hide that race, religion and national origin are some of the main factors that determine the level of intrusion and hassle a person will face. For Jews, 25-minutes may be accurate but for everyone else, that quote is laughably false. I wrote previously about my four-hour ordeal leaving through Tel Aviv’s Ben-Gurion Airport, where my heritage and religion was one of the first topics the interviewer in the terminal asked about (I’ve learned to not be surprised by the racial questions any more). In all, I had to go through two luggage searches by hand, two pat downs, and four questionings. Even if the system in place at Ben Gurion International could be copied to the hundreds of airports across the U.S. the blatant discrimination used in the screening process would clearly be unconstitutional. The focus is on the physical threat a person can pose to the airplane and its passengers preventing the possibility of arbitrary, subjective harassment that certain passengers face in the Israeli system. No one should be more or less likely to be suspected or scrutinized by law enforcement because of their race or religion. Beyond that principle though, any system that profiles based on race, national origin or religion is doomed to be more harmful to the innocent targets than its purported benefits would warrant. Not only would it be harmful to the individual rights of the thousands of innocent Muslim and Middle Eastern travelers who would become targets of such a system, it would also damage the cooperative relationship the American law enforcement authorities have spent years fostering with the Muslim community. In Israel, there is almost no cooperation between the authorities and the Palestinian and Muslim communities because of the mutual suspicion and distrust caused by generations of being targets of an ethnocentric regime. This leads to the meat of why Israel is OK with racial profiling but America should never adopt such policies. Israel’s goal is the security and advancement of the Jewish people exclusively, only one of the many national groups which live under its authority. As such Israeli authorities can target members of the various out-groups without fear of violating the foundational, Zionist, principle that Jews and Jewish interests come first in Israel even while Israel purports itself to be a democracy for all its citizens. In America, the guiding principals are in the Constitution, and the values of pluralistic democracy. Like Israel, it is a nation of immigrants; yet America has reached a level of maturity that it at least aspires to an ideal of equality among all its citizens and subjects, even if it falls short in so many cases. Israel has never been able to approve a constitution as it would require Israelis to rectify their split personality as either Jewish or democratic. To Israelis racial or religious discrimination is no threat, in fact it can be seen as helpful, because the country is based on raising one nation above others, a completely un-American ideal. Khaled is a Writer for the Media and Information Department at the Palestinian Initiative for the Promotion of Global Dialogue and Democracy (MIFTAH). He can be contacted at mid@miftah.org.